Exit polls suggest that Rajasthan is set to be the much-needed upset for Congress party ahead of the 2019 General Elections when election results for the state assembly election 2018. In a much-needed shot in the arm for the Congress ahead of the 2019 General Elections, the exit polls show Rahul Gandhi-led party taking the lead by a huge margin in Rajasthan after the state recently concluded assembly elections. The India Today-Axis My India exit poll predicts trouble for Vasundhara Raje's Bharatiya Janata Party (BJP) government and a landslide victory for Congress in the desert state. In the 200-seat Rajasthan state assembly, the India Today-Axis My India exit poll shows Congress securing as much as 141 seats, and at least 119 seats. It only needs to cross the 100-seat halfway mark to form government in the state. The exit poll puts 42 per cent vote share in Congress' favour. If the numbers hold, it could spell one spectacular comeback for Congress which managed only 21 seats in the 2013 state assembly election in Rajasthan. Things are not looking good for the incumbent BJP government with the India Today-Axis My India exit poll predicting victories in a maximum of 72 seats and at least 55 seats. This is nowhere close to the halfway mark, and makes equations to assuming power in the state explicitly unfavourable for the BJP. The exit poll shows one to three seats going to Bahujan Samaj Party (BSP), whereas others winning three to eight seats in the state. 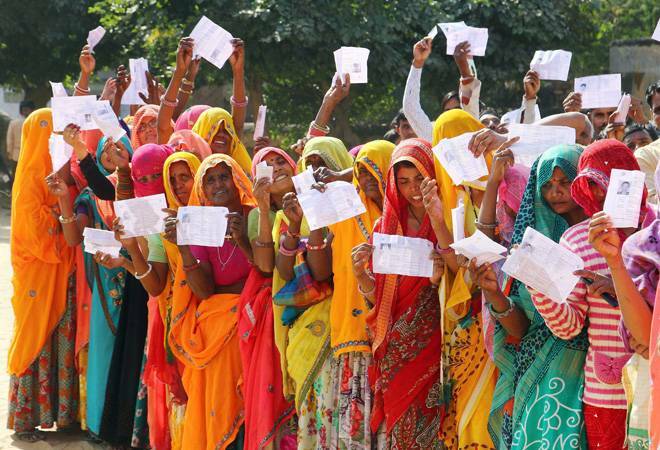 Electorate in Rajasthan, along with Chattisgarh, exercised their constitutional rights on Friday to elect their representatives for 199 seats out of the 200-seat Rajasthan state assembly. Over 72 per cent of the 4.74 crore registered voters had cast their vote. The counting of votes, along with four other states that recently went to poll, will happen on December 11. Among the 2,274 candidates in the fray are sitting Chief Minister Vasundhra Raje, Pradesh Congress Committee chief Sachin Pilot and former Chief Minister and Congress leader Ashok Gehlot. Raje is contesting from Jhalrapatan against Congress' Manvendra Singh, son of veteran BJP leader Jaswant Singh. She had won 63 per cent of the votes cast in Jhalrapatan constituency in 2013, winning the seat by a margin of 60,896. Pilot has thrown in his hat from Tonk, whereas Gehlot is contesting from Sardarpura.